THANK YOU FOR YOUR INTEREST. CHECK BACK NEXT MONTH FOR OUR NEXT PROJECT. Christmas in July!!! Yes! So that you will have plenty of time to finish this project by Christmas. And it may take you a fair amount of time, as we have filled it to the brim with tiny details. We have started with a Bespaq babyhouse. 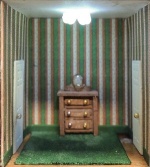 (this is a 1/12 scale piece of furniture that measures 8 1/2" tall. It contains 11 tiny rooms) The doors are embellished with laser cut appliques painted in gold leaf announcing the Night Before Christmas and Santa's arrival. 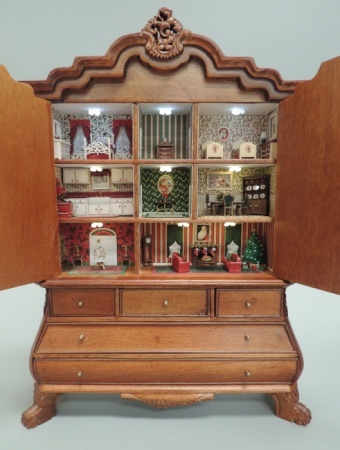 All of the little people who live in this wonderful cabinet are huge fans of the Jolly Elf, as you will soon see. The house has been modified to allow you to apply led lights in every room. The center drawer in the lower section contains the coin cell battery and on/off switch, so that it is easily accessible and very well hidden. The first floor of the house features the entry foyer and the great room. 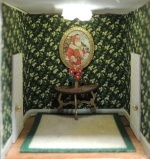 Each house has it's own custom wallpaper, and coordinating rugs. The foyer features two chairs, a garland embellished hall tree, and a center table complete with tiny decorated tree. The coffee table shows a beautiful arrangements of poinsettias. Thru the passageway, we come to the great room. 3D printed sofa and chairs surround the fireplace which is decked in garland and stockings waiting to be filled. The tree reaches almost to the ceiling and is beautifully decorated. A mass of packages are displayed beneath the tree, and a grandfather clock in the corner counts the hours until Santa's arrival. The second floor contains the kitchen, complete with festive cabinetry, and an amazing 3D printed, cherry red wood stove. The hallway contains a beautiful table and artwork and a lovely arrangement of poinsettias. Thru the hallway to the dining room, which features a lovely table and four chairs. The table is decorated with a table runner and beautiful arrangement with candles. 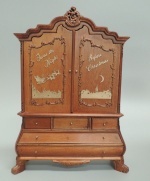 The china hutch is filled with Christmas dishes and a beautiful portrait of Santa and the woodland creatures graces the wall. Up on the third floor are the bedrooms. Mama and Papa's bedroom is wonderfully elegant, with beautiful wallpaper, draperies and rug. The elaborate scrollwork bed is dressed with red silk and laces. A lovely mirrored dresser is also included. The center hallway features a small chest and mantle clock... again, waiting for the big moment. Thru the hall is the children's room. Candy cane themed wallpaper, bedspreads and artwork fill the room. Two twin beds with candy cane bedspreads await the children, who will sleep peacefully under a lovely portrait of St. Nick. Everything you see in the photo will be included in the kit, down to the last tiny no hole bead. You will need to supply paints, glues and basic tools. Fine tweezers and good lighting are highly recommended. An extensive online tutorial will guide you thru each and every step along the way. I purchased the remaining inventory of these baby houses, and unfortunately, the quantity was very limited. Therefore, this class size will be quite small. If you are interested, do not delay, as this will probably sell out very quickly, and once the kits are all spoken for, that's all that will be produced. Please be sure to view the additional photos below and email if you have any questions.